The buzz that the Modern Taxonomy Wheel generated over the last couple of weeks has not yet died out and now we have a new updated wheel from the same guy Allan Carrington. We love Allan's work and we find it really interesting. His wheels come along in such a visually attractive way summarizing most of the apps and web tools we have been sharing here with you. If you already had a chance to have a look at the previous wheel and compare it with this new one you will notice that Allan has brought about some new updates to the new wheel. There is now a particular shared focus on both SAMR model and Bloom's digital taxonomy to help teachers better leverage technology in their teaching. 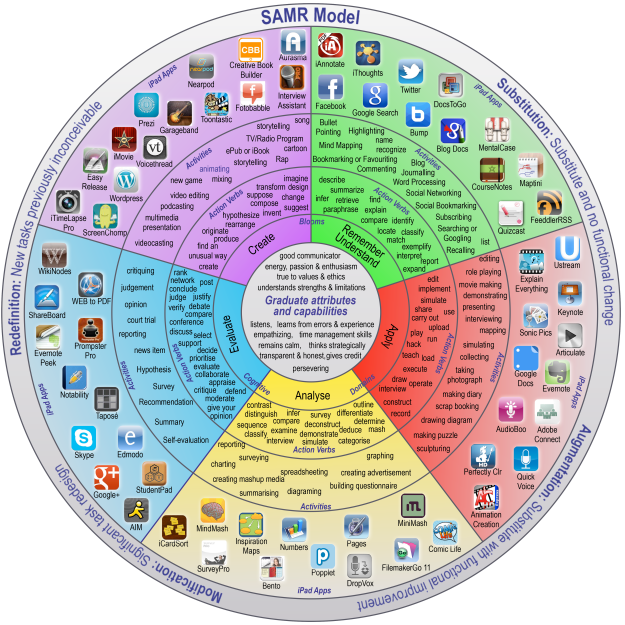 If you are not familiar with what SAMR is all about, please read this post. Now, Click on this LINK to get the poster as PDF.